Is there a new Gold Standard in Basement Finishing? Out with the old and in with the new. Every contractor catches up eventually but for quite some time, a better method of finishing basements has gone un-recognized and very rarely used in South Jersey. For over 40 years contractors have been throwing up wood studs over a 6 mil vapor barrier and faced insulation towards the living space. That method has been proven years later to be susceptible to mold growth and other moisture related issues. The basement has a relative humidity much greater than the rest of your home. Concrete is porous and every crack and gap allows even more moisture into your space. Next Level Remodeling cares about your investment. We want our finished basements to last just as long as the rest of your beautiful home. This is why we have made the following basement finishing practices our Gold Standard. Wall Preparation: We begin by testing questionable areas with clear plastic laid and taped over the suspect area to trap any moisture that may present itself. From there, we determine the best course of action to eliminate the problem area. Gaps and non-structural cracks are filled with expandable polyurethane design specifically for this condition. When all cracks are filled and the walls are water tight, we coat the interior perimeter walls with a sealer rated to hold back a significant amount of hydrostatic pressure. Every basement is unique and may require more or less effort then the examples shared above. If you are experiencing a damp basement and drainage issues, then a waterproofing specialist should be contacted prior to even considering finishing the space. 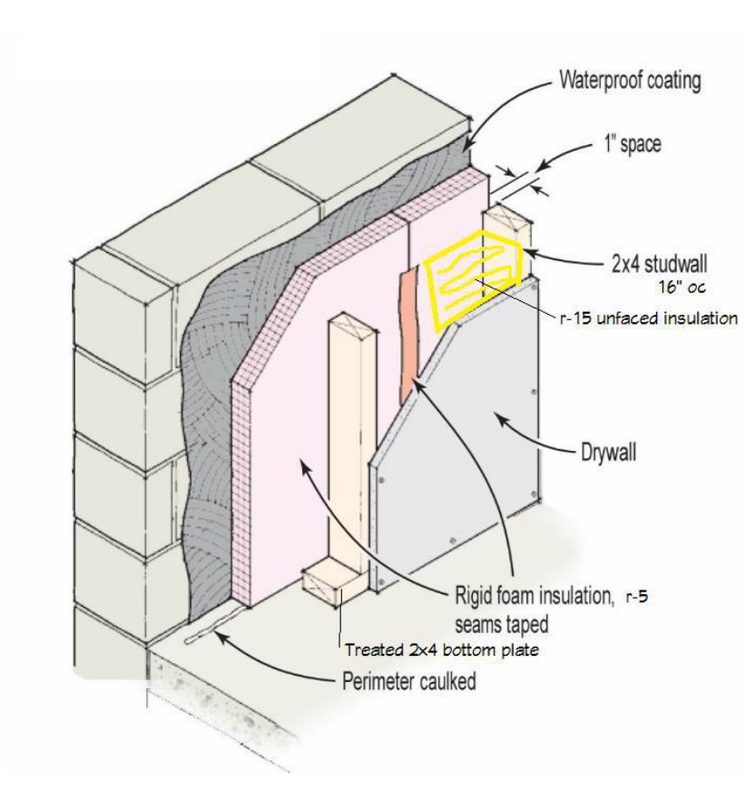 Wall Insulation and Framing: We bond 1” rigid insulation over the existing foundation walls and make sure that all seams are taped. This is the best method of creating a vapor barrier. We carry this rigid insulation up into the joist bay to make sure your rim joists are properly sealed. We frame our new stud wall in front of the newly installed insulation with a 1” gap for circulation. New un-faced R-15 insulation is installed between each stud bay and drywall at this point may commence. Floors: As for the floors, we recommend sealing the concrete and also addressing any cracks in the slab prior to installing the new flooring product. We always look for flooring materials with a built in moisture barrier or an underlayment suitable to keep moisture away from our new finishes. Treat your basement with the save level of respect as every other major project you have embarked on. The bargain basement contractor will most likely recommend the old method of construction and not understand the value of spending a little bit more to create a long lasting, tight and efficient setting.